Last year, the Taoiseach vowed to close a loophole which allowed a €1.3 billion mortgage ‘vehicle’ from paying tax. 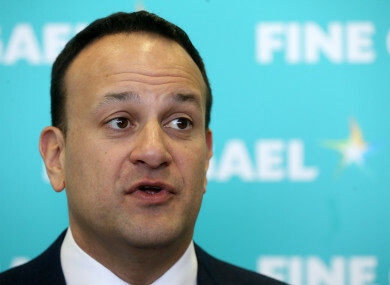 ANY TAX LOOPHOLES identified as being used by vulture funds will not be closed down until at least the autumn, according to Taoiseach Leo Varadkar. PTSB bank bosses confirmed at an Oireachtas committee that the special purpose vehicle which more than 6,000 of its mortgages have been transferred to, will be exempt from tax. At the time it was revealed, Sinn Féin’s Pearse Doherty asked the Taoiseach to bring forward emergency legislation to close the loophole. “As I understand it, companies will pay tax where they are resident but I had the opportunity to watch Deputy Pearse Doherty’s exchange at the finance committee with an official from Permanent TSB,” said the Taoiseach, who added that he has brought it to the attention of the Minister for Finance. “If there is a loophole which somebody is exploiting, we will close it if we can. The Minister is examining the matter,” he said. When asked by TheJournal.ie what has happened since that commitment, Varadkar said it is being examined by the Finance Minister Paschal Donohoe. However, he added that if something is identified, it would only be addressed in the Finance Bill. “There won’t be one of them until the autumn,” he said. The Taoiseach was also asked about the Master of the High Court, Edmund Honohan, stating this week that a case on State aid rule breaches could be brought by the European Commission in relation to the special tax treatment given to the vulture funds in Ireland. Varadkar said he is not sure what role the EU Commission would have, adding it would only be involved if “there was evidence of state aid, which would not accept”. He said the Section 110 incentives, which allowed large funds register as charities, and in turn avoid paying tax, were put in place “at a time when the property prices were on the floor”. “They were designed to encourage businesses and firms to get involved in buying property at a time when we needed it,” he said, adding that the country is in a different position now, as house prices have “bounced back and building is happening again”. “In that context we need to review those tax incentives and see if they are still advisable and appropriate,” he said. Email “Any tax loopholes used by vulture funds won't be closed down until the autumn, says Taoiseach”. Feedback on “Any tax loopholes used by vulture funds won't be closed down until the autumn, says Taoiseach”.